Before trying to hike with your dog, you should be sure your dog knows how to walk on a loose leash. Your dog should also have a good foundation of training and socialization. Otherwise, you could be dealing with your dog's poor behavior or even fear during the hike, and that's no fun for anyone. Before heading out for your hike, there are some things you should bring along. You'll want a good basic dog leash (no retractable leashes when hiking or your dog will get tangled up in something) and a sturdy dog collar with current identification or microchip. Bring along a brightly colored bandana, so hunters will not mistake your dog for a wild animal. Just as you'll bring along drinking water for yourself, make sure you have plenty of fresh water for your dog, and some healthy dog treats if it's going to be a long hike. Some basic first aid supplies and poop bags (unless you plan to bury your dog’s waste) are good to have as well. 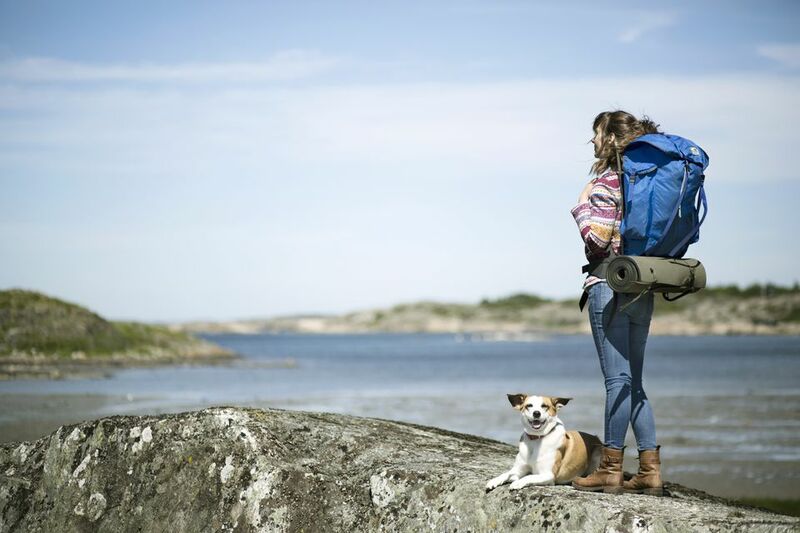 When your dog first starts hiking with you, it’s best to start with short, easy hikes and take frequent breaks to rest. This will allow the dog to build up endurance and also toughen up its paw pads (hikes can be hard on the paws). You don’t want to get out too far and find out your dog is getting worn out or is in pain. Dogs often push themselves to the point of injury or exhaustion just to keep going with you. Know your dog’s limits. Slowly increase the distance and difficulty of hikes over time so your dog will enjoy each hike from start to finish. Make sure to always allow time for rest breaks. Dogs love being outdoors and exploring all the good smells of nature. However, nature has some not-so-pleasant things to give back. Don’t allow your dog to run off-leash and explore out of your sight. It might find some unfriendly wildlife or toxic plants. A snake bite can kill your dog, and skunk spray is unpleasant. Other wildlife creatures may carry dangerous diseases like rabies. Make sure your dog is fully vaccinated, and if you're going into the wilderness, dogs should be on regular parasite prevention to prevent heartworms, fleas, ticks, and parasites. Avoid letting your dog drink water in streams and ponds as it may contain parasites that can cause serious illness; even the monthly treatment cannot protect a dog from all parasites. Familiarize yourself with basic first-aid for dogs. Check your dog’s paws regularly for cracks, wounds or foreign objects. Burrs, thistles, rocks and even insects can embed in a dog's feet, and the terrain can really irritate your dog’s paws. It's best not to hike with your dog (or at all) in very hot weather. If you hike with your dog on warm days, take frequent breaks and provide extra water. Stay in the shade as much as possible. Dogs cannot cool themselves by sweating and rely on panting to release heat, which is not very efficient. Heat stroke and exhaustion are very common in dogs. The hot ground can also burn your dog’s paw pads. Certain breeds, especially those with short muzzles, are extra sensitive to heat and should only hike short distances, no matter the temperature. Note that dogs are not allowed on some trails. Find a dog-friendly trail and follow any posted rules. Keep your dog under control. In most cases, your dog should be on a leash, even if there are no leash laws on the trail. If your dog gets away from you, it might disturb other hikers or even put itself at risk. Clean up after your dog. Pick up any dog waste or bury it properly (in a cathole at least six to eight inches deep and at least 200 feet from water, camps and trails). Don’t allow your dog to dig, destroy plants, or interact with wildlife. The plants and animals are all part of the ecosystem. Your dog is not. Not all dogs are in the right physical shape to safely go hiking. Talk to your veterinarian before you start hiking with your dog. Senior dogs might be better off going for walks. Young puppies should avoid hiking when it involves high endurance and long distances, as this could damage their growing bones. Dogs with certain health problems should also avoid hiking. You don’t want to be too far from civilization in case something happens.